The University of Virginia McIntire Department of Music presents the third of six concerts in the UVA Chamber Music Series on Sunday, January 27th at 3:30 pm in Old Cabell Hall. 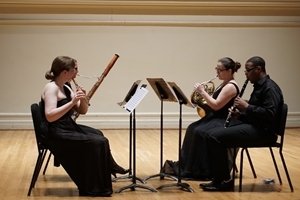 The UVA Chamber Music Series brings an array of musicians to provide professional performances to the University and the central Virginia community. Directed by Kelly Sulick, the programs offer a wide range of works that are sure to entertain, educate and enthrall. The University of Virginia Chamber Music Series is supported by the George F. and Marion E. Jones Endowed Lectureship Fund.